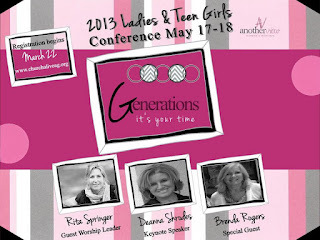 Deanna Shrodes: Generations -- It's Your Time! Even more excited to be with Pastor Laura Lee, one of my favorite people, and the host of this conference. She's a power hitter...someone everyone loves to be around, especially other leaders like me, who can learn from her. One of my favorite things to do is listen and learn from others. Well, my suitcase is packed, I'm on my way to the airport, (or maybe up in the air or arrived in Raleigh by the time anyone reads this) and I'm in continual prayer for God to do amazing things this weekend. Please join me in prayer, to that end.